Blindspotting is a contemporary riff on Spike Lee’s 1989 masterpiece Do the Right Thing. Take Lee’s character Mookie, make him a parolee, tamp down the wisecracks, and you’ve got Collin (Daveed Diggs); transform John Turturro’s dumb-as-a-brick Pino into the short-fused black wannabe Miles (Rafael Casal), and you’re on the right track. There’s not a thing wrong with any of this; Lee’s heralded film–though it still dazzles–is in need of an update. 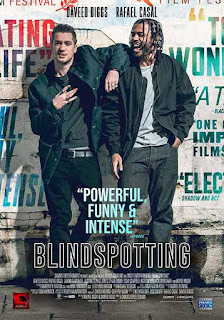 Blindspotting would certainly rank high upon my list of should-be-seen overlooked films of 2018. Director Carlos Lopez Estrada’s film shifts from Harlem to Oakland, the city of which Diggs–who made a splash in the play Hamilton–is a native. Diggs and Casal wrote the screenplay with the goal of correcting stereotypes of the Bay Area. We detect many of the same elements of Lee’s Harlem, especially views of neighborhoods in transition. Oakland was a Black Panther epicenter during the 1960s and, like Harlem, endured a reputation for being dangerous–read white people don’t want to go there–long after the Panthers faded. These days, you need to have inherited property or be wealthy to live in places such as San Francisco, Berkeley, Cupertino, or Palo Alto, which means that Oakland is becoming gentrified by whites of more modest means. Racism, though, remains the constant. Blindspotting unfolds over the 72 hours before Collin can walk away from his halfway house curfew as a free man. We learn in flashback sequences that his conviction for a brutal beating of a white hipster outside the bar in which he was a bouncer was only partly as it played out in court, but being black in Oakland around white cops has–shall we say– disadvantages. Collin is truly trying to change his life, which isn’t easy around his best friend Miles (Casal). Unlike Pino in Do the Right Thing, Miles has the capacity to be both dumb and dangerous. He adopts black lingo, carries himself with a rapper’s swagger, and has a bad habit of brandishing a gun, the latter a no-no for Collin as it could send him back to prison. Miles isn’t black, but he presents as such; he even has a black girlfriend with whom he has a mixed race son, but he’s definitely a guy Collin should lose. Still, how do you give the bum’s rush to a guy who has been your best friend since childhood and with whom you work everyday? (Collin and Miles work for the same moving company.) And how do you convince your ex-girlfriend, Valerie, that you’re not a thug when you keep such company? This lead us to the film’s central theme. “Blindspotting” is the mnemonic device that Valerie (Janina Gavankar)–who is studying psychology–uses to remember Rubin’s vase. What do we perceive when we see the image, a lamp base or two opposing faces? Indeed, how do we form our perceptions, and can we trust them? When Collin is rushing to make curfew and observes a running black man gunned down by a white cop, what has he seen? What was the cop’s perception? It is a chilling moment and Estrada uses it to heighten the sense of fear felt by young black men as they navigate their way through what most white folks would call “normal” life. It is also a Rubin’s vase test on how we the viewers see race. Like Do the Right Thing, the film builds to a flashpoint that tests all the ways of seeing that you might imagine. Thirty years on, Estrada’s budget was just 1/6 of what Lee had available to him. This means Blindspotting sometimes has a handmade look, but in this case the wallet in no way limits the film’s wallop. It is billed as comedy drama, and that may be one of the film’s limitations. There are some funny scenes, mainly vignettes related to Miles’ huckster abilities. Some critics have said that these and Collin’s walking dream sequences blunted the film’s emotional power. I urge you, though, to see this film and to think hard upon the question of what and how we see. In essence, we all have “blind” spots. What is yours?